“Arturo Toscanini was music director of the New York Philharmonic from 1928 to 1936 (in the early years, he shared that title with Willem Mengelberg). The Toscanini-New York Philharmonic recordings from this period, both studio and in-performance, document a remarkable, perhaps unique, collaboration. The precision of attack, immaculate blending of registers, beauty of tone, flexibility of phrasing, and dramatic sweep and momentum are breathtaking. We are fortunate that Toscanini made several magnificent studio recordings in the 1920s and ‘30s with the New York Philharmonic. And we are doubly fortunate that Richard Caniell and Immortal Performances have devoted themselves to preserving, in the best possible sound, concert performances by these same artists. 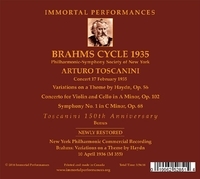 And so it is with a new release by Immortal Performances, a February 17, 1935 Carnegie Hall broadcast, featuring the Brahms ‘Haydn Variations’, Double Concerto, and First Symphony. This program served to launch a five-concert survey of the German composer’s music. For anyone seeking a fuller representation of Toscanini’s art, it would be difficult to overstate the importance of his New York Philharmonic collaborations. When Toscanini left the New York Philharmonic in 1936, he was 69, and would conduct for almost 20 more years. Those final decades, and the recordings Toscanini made with the NBC Symphony Orchestra are by far the most well-known documents of Toscanini’s conducting. To be sure, those are impressive recordings in their own right, but they also reflect a far more straightforward, streamlined approach. In the November/December 2016 issue of Fanfare (40:2), I reviewed an Immortal Performances issue of Toscanini’s first concert with the NBC Symphony Orchestra, broadcast Christmas Day 1937. That concert, too, ended with the Brahms First Symphony. 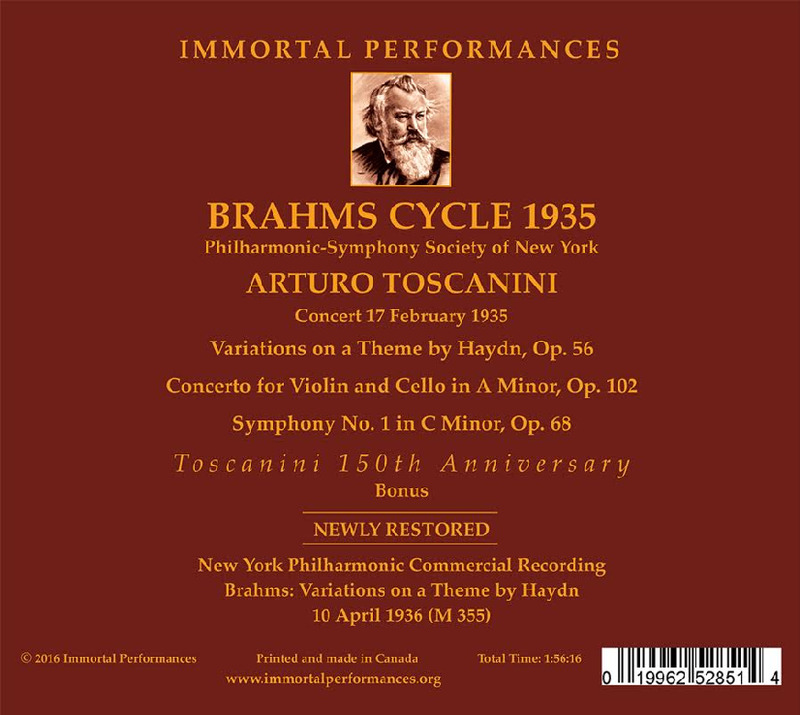 I noted that the 1937 Toscanini-NBC Symphony Brahms First revealed a greater flexibility of tempo and phrasing than their 1941 studio recording (in turn, more flexible than their subsequent renditions). But the February 17, 1935 Toscanini-New York Philharmonic Brahms First offers an improvisational approach beyond even the 1937 NBC début concert. Of course, that sense of improvisation (immaculately executed) was the result of painstaking rehearsal by Toscanini and the New York Philharmonic. But the mesmerizing application of rubato (take, as just one example of many, the closing measures of the first movement) is so striking, I wonder how many in a ‘blindfold listening’ would guess the conductor is, in fact, Toscanini. And because this 1935 Brahms First is both so majestically played, and stands in such contrast to subsequent Toscanini interpretations, I believe it demands to be heard by all who care about his legacy - and Brahms’ legacy, for that matter. The performances of the Brahms ‘Haydn Variations ‘and Double Concerto are on a similarly high level. In 1936, Toscanini and the New York Philharmonic made a justly famous studio recording of the ‘Haydn Variations’, one that remains among the greatest ever committed to disc. That studio recording, lovingly remastered by Richard Caniell, is included as an appendix to this concert. The 1935 broadcast concert reflects a similar approach, with, perhaps again a slightly greater flexibility, and that extra degree of electricity inspired by the presence of an audience. I am grateful to have both versions. 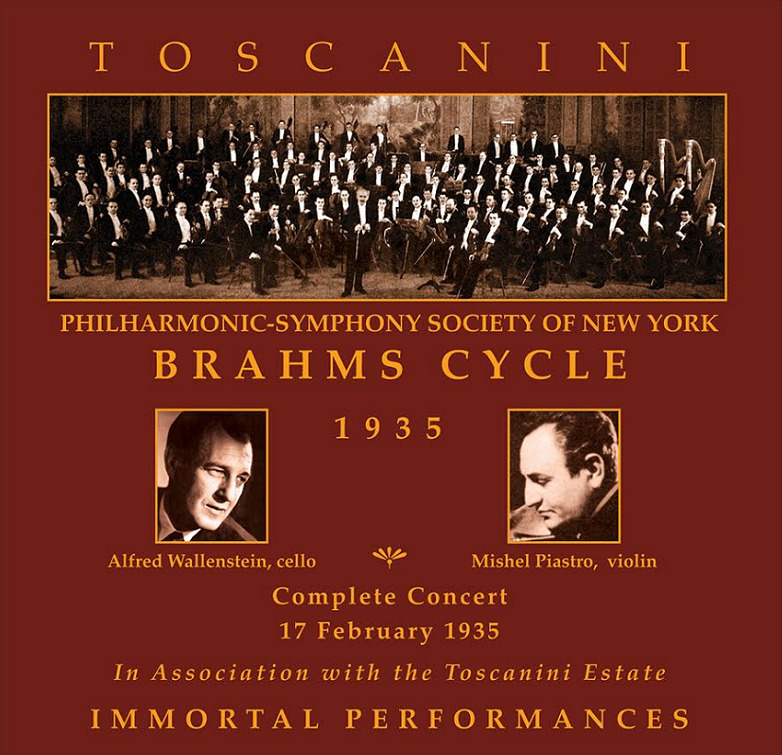 Violinist Michel Piastro and cellist Alfred Wallenstein, New York Philharmonic principals during Toscanini’s tenure, are superb soloists in the Brahms Double Concerto. Once again, the combination of precision and flexibility of execution by all concerned is extraordinary. In his Recording Notes, Richard Caniell describes the challenge of attempting to rectify the constantly fluctuating balance between soloists and orchestra created by the broadcast engineers. To my ears, Caniell has done a superb job with the balances sounding quite natural and appropriate throughout.